Orbus is known for producing cross trainers with powerful flywheels, and the XT7 is no exception. With a 12kg flywheel, this elliptical delivers smooth gliding movement and a powerful workout that will leave you feeling spent. Before we delve into our detailed review, let’s take a quick glance at the pros and cons of this model. Click here to see the Orbus XT7 on Amazon. The Orbus XT7 is a brilliant piece of workout equipment. While assembly is difficult and time-consuming, the end results are well worth the effort. After completing numerous workouts on this machine, we can confidently say that the XT7 offers excellent value when compared to the models in our cross trainer guide. It all starts with the 12 kg flywheel, which allows for silent operation and smooth movement. We’re not sure we’ve ever used another elliptical that offered such smooth operation. You stride through each glide without even realizing it – okay, you do realize it if you have the resistance turned up. Speaking of resistance, the XT7 offers eight tension levels to add challenge to your workout. If you’re an advanced user, you may find that the highest setting is still a tad too easy. But for most users, the XT7 will provide you with a difficult workout that will help you burn more calories and gain strength. To add variety to your workout, Orbus includes dual action handlebars that allow you to also get an upper body workout. The stationary handlebars are located near the on board computer, and include heart rate sensors. This allows you to monitor your heart rate during your workout in a quick and convenient way. Just below the stationary bars is the resistance knob. 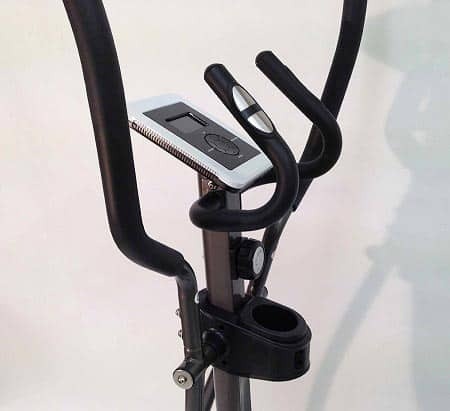 This knob allows you to change the resistance level on the cross trainer with ease. Because of its convenient location, you can easily make your workouts more difficult or ease up on the tension without ever having to stop. As for durability, the XT7 earns high scores in our book. This model is constructed with high-gauge, tubular steel for the utmost in durability. It does take some time to put this cross trainer together, so be prepared to spend two hours or more on assembly. The only issue we had with this cross trainer was that it lacked any built-in workouts. Most cross trainers include this feature, but for the price and brilliant performance of this model, we can’t complain. 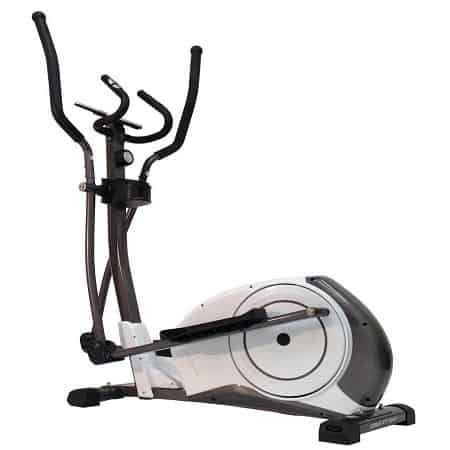 If you’re looking for an affordable elliptical that offers challenging workouts, near-silent operation and smooth movement, the Orbus XT7 won’t disappoint.